Is surfing and cruising your favorite sport? If so, you know that you cannot have a good experience without a comfortable and sturdy board. As such, you should take much time to search for the best stand-up paddle board, since you do not want to ruin your experience or spend your cash on a board that is not worth our money. Without an idea of what you should look for on a stand-up paddleboard, making a purchase can be difficult. As such, it is worth that you get an idea of at least one stand-up paddleboard that you should consider when making a purchase. In our research, we came across the Xterra inflatable paddle board which we thought that it is worth sharing an idea of what it entails with you. 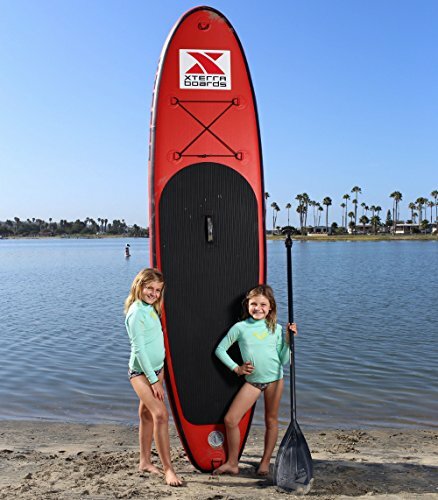 This inflatable stand-up paddle board provided most previous clients with a good experience, while it includes several features that a good paddle board should include. So, have a look at the Xterra inflatable paddle board review below, as it might be the answer to what you have been searching for. As one of the Xterra boards, it makes one of the best inflatable stand-up paddle boards available for sale. When it comes to its construction, this board utilizes unmatched rigid military grade drop stitch material that covers the top, bottom, and sides to enhance its durability and quality. As such, this board performs in all conditions. Whats more is that this paddle board features double-sided reinforcement which enhances its quality. With this board, therefore, dings and dents shouldn't be a bother to you. The boards can fall off the roof of your car and even have a car run over them without them breaking or getting dents. Therefore, this renders them to be of high quality and durability to give you many years of enjoyment. This stand-up paddle board has a design that makes it suitable for an all-rounded use. It measures 6.5 x 30 x 120 inches while it weighs 29 pounds. The paddle has an adjustable length to make it suitable for use by users of differents heights. Moreover, the board can support users of different weights up to 250 lbs when inflated. Owing to its construction, this board inflates in five minutes to make it ready for use. As such, you can rest assured not to have any time wasted before you can get to the waters and begin your favorite sports. 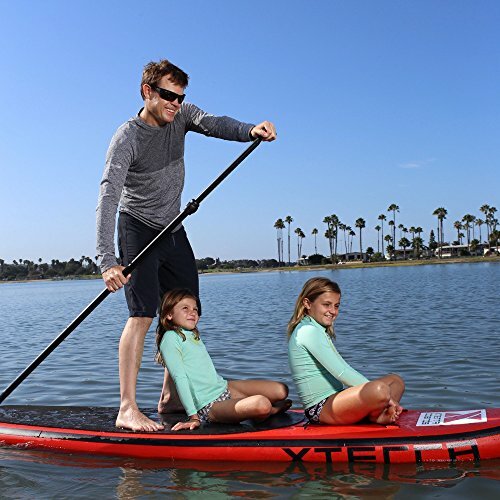 The Xterra Black Inflatable 10' Stand Up Paddle Board is easy to carry since it is light in weight. Moreover, it comes with a backpack into which you can put it for an easy conveyance. Once your adventure is over, it only requires you to deflate it, fold, and fit it into the backpack. Hence, you can take your paddle board with you wherever you go. With this Xterra board, stability should never be a concern to you since it has the stability like that of hardboard. Also, you should not worry about your boat sagging after a few days of use. The reason behind this is that this product has a 6-inch thickness that is ideal to give you a balanced ride while making you maintain your position high on the water. Even better, you can use these board for two or three person rides, since it gives accommodation to up to 250 lbs. Once you get this stand up paddle board, several things come along with it to enhance its maintenance and transport. Some of these items include a removable travel fin, pump and gauge, a roller bag backpack, adjustable paddle, mini dry bag, ankle leash, the board and a repair kit. Therefore, this makes worth your money, as with all these inclusions, you will not have to spend more to enhance the usability of your board. It is super easy and fast to inflate. Provides an excellent value for money. Do the paddles float on water? Answer: Yes, since they have foam on the inside. Does this board get hot in the sun? Answer: It can get hot, but it doesn't get hot while on the water since a splash of water cools it. Can you use the board for yoga? Answer: Yes, the board provides enough stability. Now that you know that this paddle board is stable and durable enough, who are these boards designed for and for what purpose? 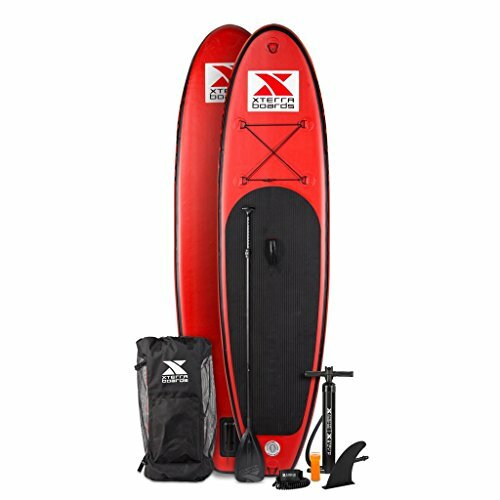 The Xterra inflatable paddle boards are tailored to meet your surfing, cruising and even your playing needs. Cruising can be in streams, lakes, rivers, and oceans. When it comes to playing, you can inflate them and leave them for your kids to jump on them. Whats more is that these boards are suitable for use by both beginners and professionals alike. Based on the Xterra inflatable paddle board review as discussed above, I hope that you now know what this board entails. With it features, you can now tell why it is important for your surfing, yoga, touring, racing, or cruising experience. Moreover, the pros and cons, give you a brief idea of what you should expect once you purchase one of these for your gaming. 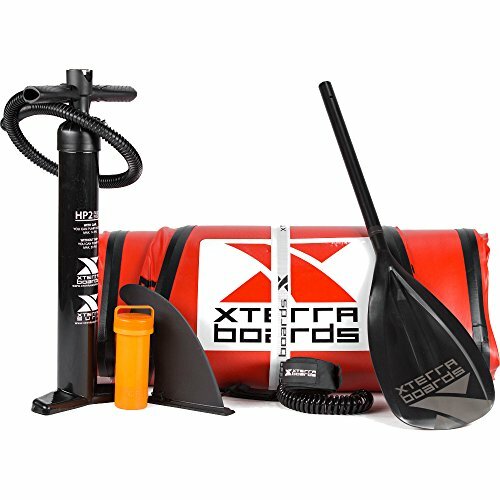 Despite some customers stating that Xterra inflatable paddle board is expensive, they added saying that it is worth it since it provides all that you would ask for on a paddle board. It is durable, light, easy to use, sturdy, stable, and the list is endless. As such, it worth that you try out this board while searching for the best paddle board. After all, it is better that you invest on a board that gives the assurance of a long life experience rather than one you can buy at a low price only to end up replacing it.